The people of Indian Society have been very receptive to the different kind of addictions due to lack of education, awareness and knowledge. Once they get to know about what they are doing actually, then chain of addiction can be broken. At the first instance its to be preached about what they are actually doing and why and how they have been suffering the never ending sorrows. The Govt efforts are not sufficient in term of spreading awareness in society. Some time its is realized that its promoting this business by giving tax subsidy on different levels. The Govt do not have any plan to save people from tobacco and liquor. Therefore The Human Life Foundation has started a De-addiction awareness campaign to aware and educate people about the ill effects of liquor and tobacco in our society. 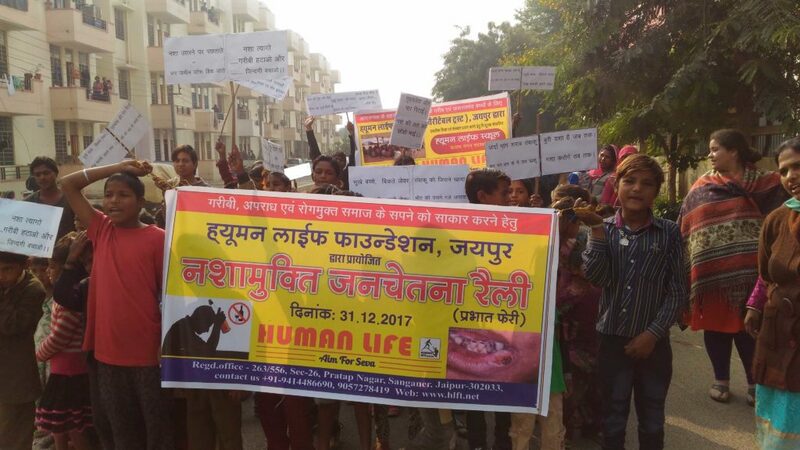 Human Life Foundation has organized a De-addction mass awareness Rally in slum of Pratap Nagar and Jagatpura area where the situation is grim. The small kids of Human Life School, a free education centre for those families who have been severely affected from this disease, has been participated in rally. the college youth also gave the message of De- addiction. Mr Pankaj Gangwani of Kaushalama Foundation, Shri Ashutosh Bhatanagar of Cambrige English Institute, Shri Vishwa Bhushan Shrivastava of BSCL, Mr Sunil Bansal ji attended, participated and addressed the rally and spread the message of de-addiction.